When I was 12 I spent most of my time arguing over which Teenage Mutant Ninja Turtle was the coolest (Raphael, obviously), so watching an opera composed by a 12-year-old is a humbling experience, even if that 12-year-old is Wolfgang Amadeus Mozart. This is Bastien und Bastienne, one half of a double-bill with Der Schauspieldirektor, directed by Anna Pool and Berrak Dyer and performed by Pop-Up Opera. The company's mission statement is to broaden the appeal of opera by staging productions in unusual locations, combined with irreverent adaptations that preserve the tone but update the humour. It's a style that proves perfect for these two farcical comedies that poke fun at stuffy, self-obsessed elites. First up is Der Schauspieldirektor, a 'singspiel' (basically half comedy/half music) about an impoverished arts company holding auditions for its next production. Problems arise when two sopranos, faded star Madame Herz (Sarah Helena Foubert) and talented newcomer Mademoiselle Silberklang (Hazel McBain) compete for the same role. There's only enough money to hire one of them, so the two women attempt to vocally outdo one another and claim the coveted title of prima donna. Aside from the competing aria and rondo, this is primarily a goofy self-referential comedy about the difficulties of receiving Arts Council Funding and the egomania of theatre producers. 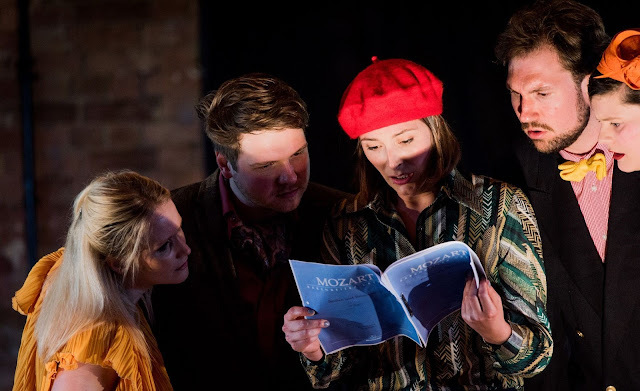 Though it occasionally borders on being a bit too broad, Wesley Biggs and Laura Cheetham serve up two energetic, nervy caricatures familiar to anyone involved in backstage drama, with Foubert and McBain injecting their respective aria and rondo with character and humour. But Der Schauspieldirektor proves to be a mere appetiser for the much more satisfying main course of Bastien und Bastienne. This opera tells the story of a dippy teenage couple on the outs. Bastien (Nick Allen) has been putting it about with the rich ladies in town, enraging his girlfriend Bastienne (Laura Cheetham). Despite their current woes, they're still besotted with one another, and so turn to mystical love guru Colas in an attempt to solve their problems with new age nonsense and yoga. I've seen many Pop-Up Opera productions, but Bastien und Bastienne feels like the platonic ideal of what the company wants to achieve. The piece is performed in the original German and translated via Harry Percival's extremely funny surtitles. When Bastienne is furiously denouncing a recalcitrant Bastien, her rage is summarised as "jog on mate", and later her despair that her man has strayed is translated as her bemoaning that her "milkshake really isn't bringing the boys to the yard". I had a smile on my face from start to finish, with Bastien und Bastienne effortlessly sailing past my "three giggles" comedy test in about five minutes. One of opera's biggest hurdles is perceived inaccessibility - a reputation is often well-deserved. But I simply can't imagine any audience not enjoying this particular production. The egalitarian, welcoming atmosphere the company create was amplified by Bethnal Green Working Men's Club, providing a charmingly bedraggled backdrop that aches with community history. The show is set to go on tour over the next few weeks to a variety of excellent venues, including the attractively bombed out Asylum Chapel in Peckham, the acoustically incredible Thames Tunnel Shaft at the Brunel Museum and the enjoyably whiffy Garlic Farm on the Isle of Wight. There's many more listed on their website, but I can confidently predict that this show is going to delight wherever it goes. 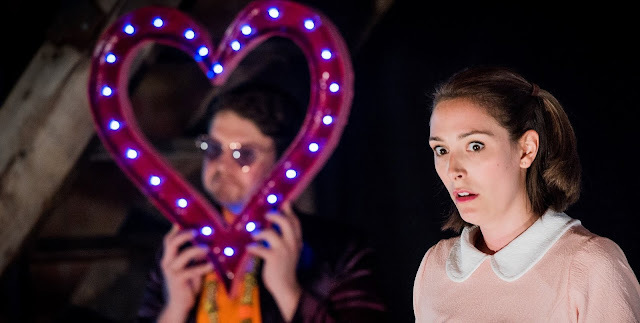 Boring simply isn't in Pop-Up Opera's vocabulary and whether you're opera-sceptical or a die-hard fanatic you'll find great heaping piles of things to enjoy. I left happy and satisfied, with my only complaint that my cheeks were sore from grinning so much. Check it out! 'Der Schauspieldirektor & Bastien Und Bastienne is on tour until 27th July 2018. Details here. © All articles copyright LONDON CITY NIGHTS.